Business leaders from across the Chicago region are urging the next Illinois Governor to spend a “fair share” of state transportation dollars for a new, dedicated Bike Walk Fund. The leaders say more investment in biking, walking and public transit is needed for their companies to continue to attract top talent to Chicago from around the world. See the official letter and the full list of CEOs. Despite recent progress, peer regions that compete with Chicago for jobs move a larger share of people without cars via walking, biking and transit. In Chicago, only 37 percent of residents commute to work on foot, bike, train or bus, as compared to 49 percent of commuters in Boston and San Francisco and 54 percent of D.C. residents. Other regions, like Denver and L.A., threaten to surpass metro Chicago with major new investments in public transit expansion. Active Trans has been building support for an Illinois Bike Walk Fund among legislators and business and community leaders throughout the year. Sign a petition to the next governor and general assembly for an Illinois Bike Walk Fund. Eight community leaders recently endorsed the fund, saying it should be used for new biking and walking projects on corridors where the most crashes occur, many of which are in low-income communities and communities of color. The leaders say historically disinvested communities with the greatest barriers to biking and walking must be prioritized with any new funding. Nearly 400 Illinois residents have already signed Active Trans’ petition to the next governor and general assembly in Illinois. We are planning to work with community partners and legislators on a bill to establish the fund in the next legislative session in January 2019. 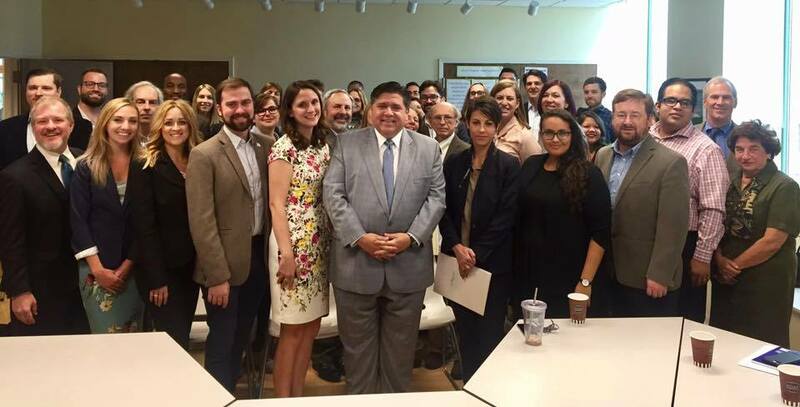 Photo caption: Active Trans participated in an environmental issue briefing with J.B. Pritzker and other candidates during primary election season in September 2017.